It’s 8:20 am here in Takotna. The temperature is -28 degrees Fahrenheit. The sunrise is incredible and the air is crisp. And according to the tracker, I am now the Red Lantern! 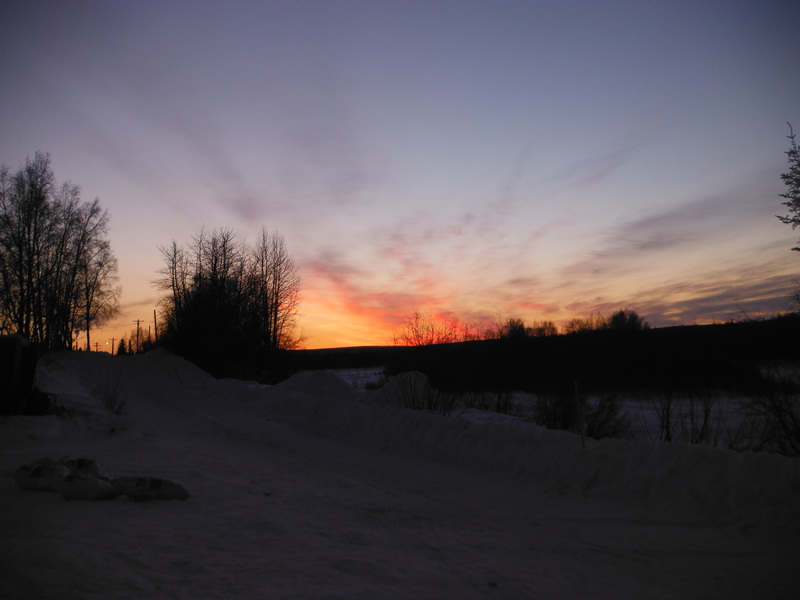 Our last musher, Marcelle Fressineau, has come and gone. Watching her arrive was unbelievably beautiful Usually what happens is that someone comes into the checkpoint and says, “Musher on the river” and everyone gets on their coats and heads out in time to see the musher come down the road. This time, I was outside taking pictures of the amazing sunrise, so I actually got to see her cross the river silhouetted by the sunrise. It was perfect! She crossed the river and came up onto the road and into town. I even got to help this time! I held the leaders so that she could take care of business. The leaders were a perfectly mismatched pair. One had a black face with the most beautiful baby blue eyes and the other was all white. They were so calm and just waited for Marcelle to do what she needed to do. They looked back at her occasionally to check what she was doing, but they were perfectly content to be petted and loved on. I was rubbing the black one behind both ears and his eyes started to close – I got a little worried I was putting him to sleep, so I went back to just rubbing his chin! Marcelle went through her drop bags, gave each dog snack, changed out a few booties, had a cup of coffee and was on her way! Her team got a little confused heading out of town like so many others have! There really must be something fascinating about that snowmachine trail to the right! But they got it worked out and they are off. So that’s pretty much it for Takotna. The vets are going to do their clinic for the village dogs today. Things will get packed up and people will wait for the planes to pick them up. Most of us are headed up trail but for some, this is their last stop and they are headed home. I’ve come to realize there are a lot of goodbyes associated with this race. People become your life for the time you are here – we are all connected by something so amazing and powerful. We eat, work, and sleep together. You learn people’s personalities and their mannerisms and their sense of humor… and then you are gone. You may or may not see them up trail. It’s kind of bittersweet. We are leaving in our wake several things that the village will wrap up for us. Actually more then several. There are bunches and bunches of drop bags. There are the bags of all the mushers who scratched, the bags of the mushers who blew through without looking at them, and the bags that the mushers opened and used some of but not all of. The villagers will go through the bags and pull out the perishable things – the people food and the dog food – and distribute it among the people who live here. They will pack up the remaining items – sled runners, dog booties, dog coats, etc – into the musher’s return bags and will have them shipped back to the mushers. Keep watching that tracker! Hopefully I’m poised to jump back into the middle of the pack sometime today!